Well what do you know? Not posting for a while hasn't decreased the piles of cards I need to show off in posts! That includes one over on TMM this afternoon, by the way. 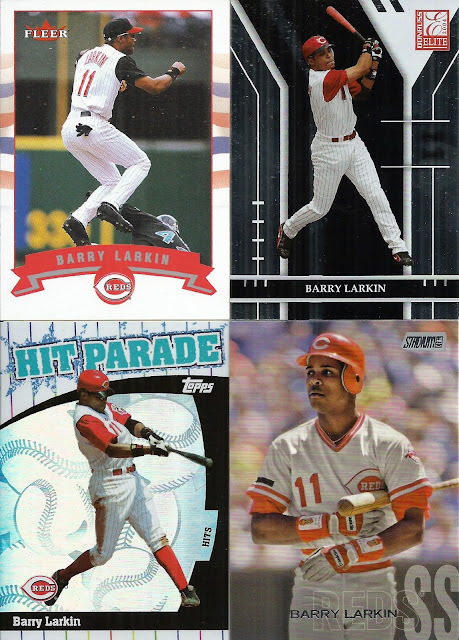 Let's celebrate my first post of February with a guy whose first name rhymes with the month: Barry Larkin! We're starting all the way back in '92 with the second of Barry's Topps Gold parallels, this one a UER as the team in the bottom right corner says "Astros", an error that was repeated, then corrected on the Gold Winners cards. Then we get into a nice Donruss/Leaf/Pinnacle run with Limited, Signature, VXP 1.0, and Mint cards from 1996-98, plus a super cool die-cut Lasting Memories insert from the last year in that run--a card I was surprised to land for so cheap on Sportlots. 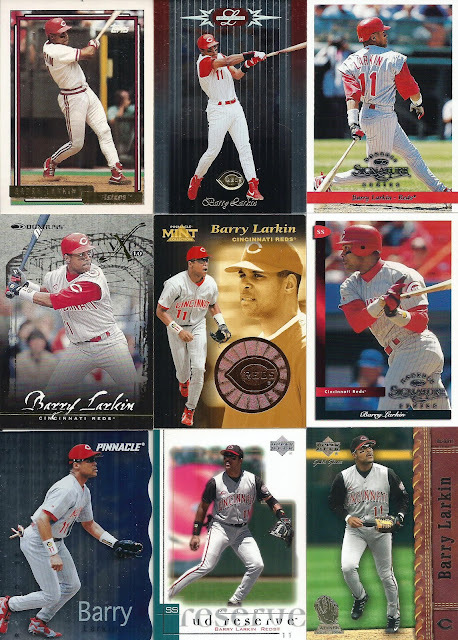 Glove stories are the focus of the last two in this scan: UD-branded cards from 2001 out of Reserve and Gold Glove. The latter is a set I may try to end up with one day. Here's one more small group of verticals. 2002 Fleer's design takes away from an otherwise fantastic photo of Larkin turning two, and a bit of sleuthing makes me think that might be Preston Wilson of the Marlins making a cameo. I finally added the "regular" 2004 Donruss Elite base after getting the Extra Edition version by accident a couple times. That same year's Topps was near the end of my interest in that brand's products but still offered the rare fun insert like Hit Parade. And of course I was all over grabbing another Stadium Club offering, this one from 2018, featuring a photo from much earlier in the HOFer's career. As with videos in this age of HD (turn your cameras 90 degrees, idiots! ), baseball action often lends itself to horizontally-oriented photos like these. I scored yet another UD-produced hologram card, in this case from '92, and added a pair of '94 Collector's Choice issues from the manufacturer's debut of that product as well. Speaking of parallels a '95 Stadium Club Virtual Reality insert features another very cool action photo, if you can call laying around on the job "action". One of Topps' more out-there products, D3, was made that same year, and I bet you can see why it was a one-and-done. Pinnacle's Aficionado taught me the meaning of that Spanish word and had a very cool looking design I wish we could have seen more of. Lastly, I scored one more insert on the cheap, 2001 Fleer Tradition Diamond Tributes, starring a guy who definitely deserved it. 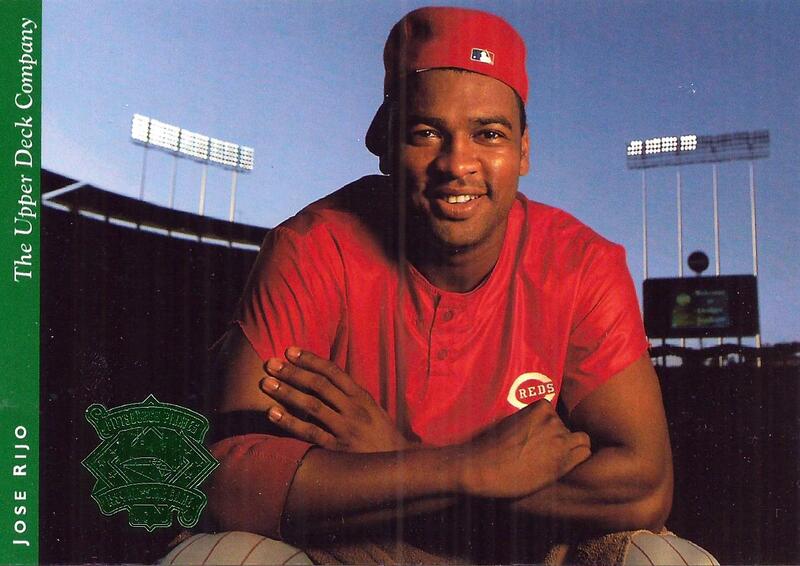 That's both sides of a 1994 Upper Deck All-Star Jumbos card from a boxed set UD produced that year. Beckett's OPG says that most of the photography was done by the legendary Walter Iooss Jr., as in the guy that had his own insert set in the previous year's product. Barry was indeed at the Midsummer Classic in '94 during a run that saw him selected in nine of 10 seasons. 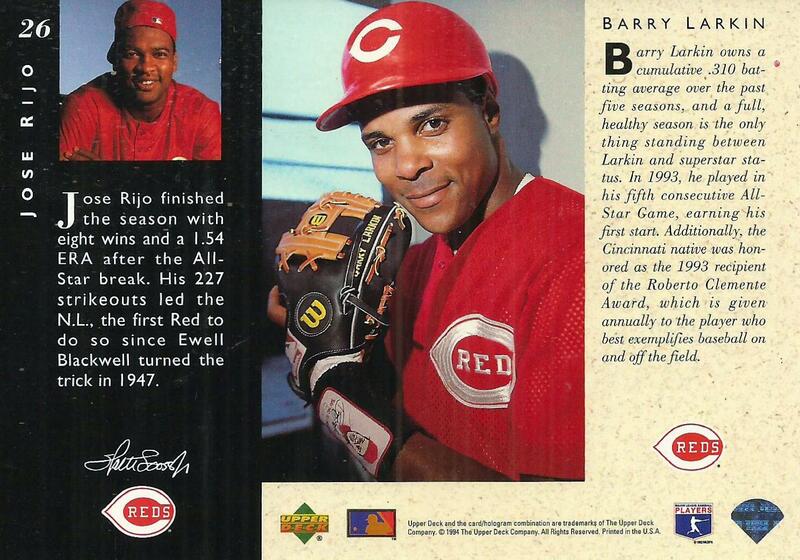 His teammate Rijo was coming off a career-best 9.2 bWAR and did pretty well during the strike-shortened season. As usual the Iooss photography is excellent and this is a fun piece to add. 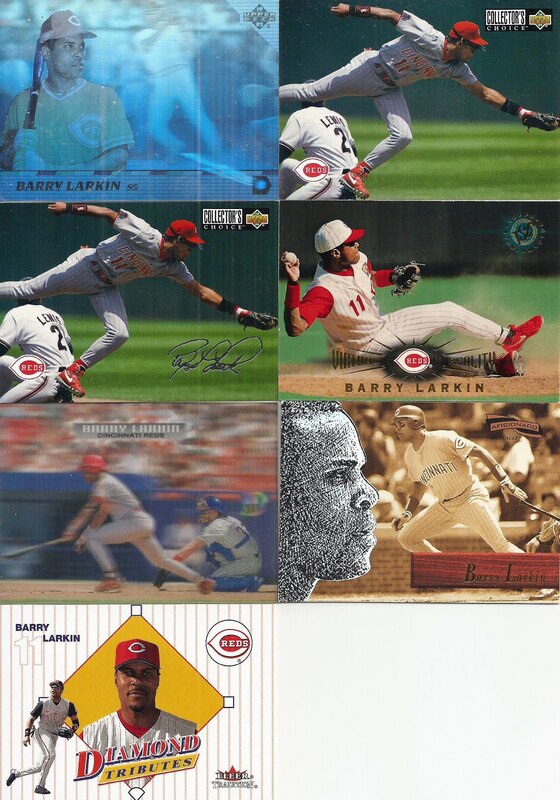 Larkin's haul continues to cement him near the top of my PCs at 745 cards, behind only Ripken and Griffey, a couple guys you'll see in upcoming posts. But first I'll be giving you a look at what I picked up at this month's card show! Still the best card decade! I actually really liked that Topps D3 set. I know it's just a Kellogg's or Sportsflics knockoff... but I had fun busting open a box and building that set.